The American Express Business Gold Card currently has an Informr score of 7.5 out of 10. This score is based on our evaluation of 8 sources including reviews from users and the web's most trusted critics. 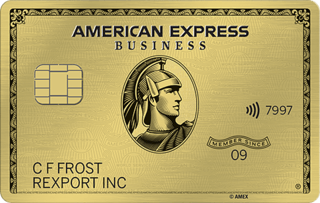 American Express Business Gold Card is typically available to those with good credit scores (650 or greater). The American Express Business Gold Card is a great choice for entrepreneurs and business owners who spend heavily within the bonus categories and can use Amex’s travel partners. If you have a medium-sized travel budget and you don’t want major benefits, this card is great. Having rewards categories that automatically sync with expenses can be a boon. But other cards offer a similar degree of customization, for lower annual fees. - Plus up to 1 year free of G Suite Basic for 3 users and up to 1 year of ZipRecruiter Standard. Prospective cardholders should keep in mind that the American Express® Business Gold Card has a pretty high annual fee of $295. However, with free employee cards with no annual fee, the valuable subscription bonus, a high rewards rate and a host of expense management tools and American Express perks, it could be well worth the fee. The Business Amex Gold is a rewards focused card aimed at maximizing the number of points received from your annual business expenses, although it's a little light on benefits for the annual fee. The revised welcome offer only provides tangible value for a small subset of businesses, and we don’t see it being a primary motivator to acquire the card. Rather, it’s icing on the cake if you already use either service prior to getting the Business Amex Gold. The new Business Gold Card is certainly not for everyone, but for larger companies looking for a no-hassle one-card strategy that still earns travel rewards, this could be a great option. Much of the mental calculus around this card boils down to how much you’re able to spend on the 4x bonus categories and whether or not you get any value out of the ZipRecruiter and G Suite welcome offer.